We missed the bigger part of the storm that came up the East Coast Tuesday. We got a layer of rain and freezing rain in between a couple of small snows. There is about 3-4 inches on the ground, but the roads are tricky in places because of the ice underneath. It was enough snow that I put the snow blade on the neighbors four-wheeler and scraped off both of our driveways. My hopes is that some of the ice underneath will melt a bit easier without the snow on top. 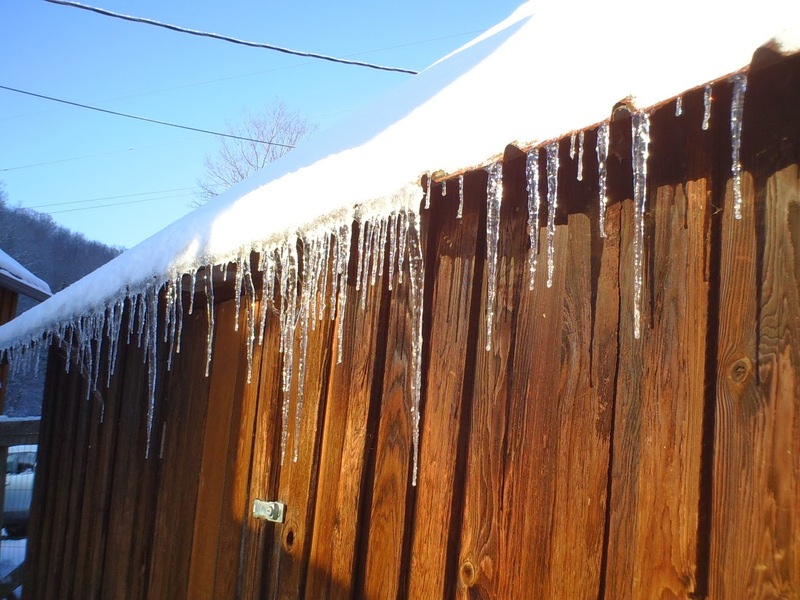 The icycles are hanging like fine crystals on the side of the barn and sparkle in the sun when it peaks out from behind the clouds. You could also see the ice on the tree yesterday from the rain two days earlier. If all of that had been snow we would have been knee deep for sure. 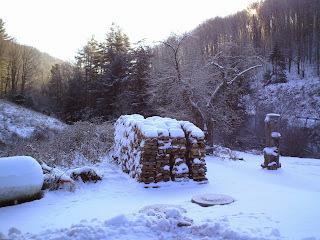 The firewood for next year is covered with a blanket of snow. It always makes me feel a little rich to see a big stack of firewood all ready and waiting. Sort of like a Leetonia winter heating bank. Temperatures have been a bit below normal with a few lows in single digits already. Nothing like sitting close to a warm fire on those days. There were a lot of bear hunters up before Thanksgiving but I haven't heard of any local results. The woods was fairly quiet over Thanksgiving day and we enjoyed a large meal that Lee fixed. I think it could have fed about ten people instead of two. We will probably be eating it much of the next week. It never seems right that you spend so many hours cooking such a feast and the eating of it takes so little time. Our feral cat, Felix, has been totally spoiled for going outside. I have to push him out most the time and it isn't long before he is begging to get back in. He seems to think the dogs should be his best friends and he is constantly rubbing up against them and batting at Leo's wagging tail. That latter action gets a growl from Leo but he is too slow to show the cat he really means business and the cat just thinks it is a fun game. Still looking for a home for him if any of you want a nice cat. Mountain girl, Paula, logging out. Yesterday it was a nice 45 degree fall day, but half way through the day the wind picked up and the temperature dropped quickly. 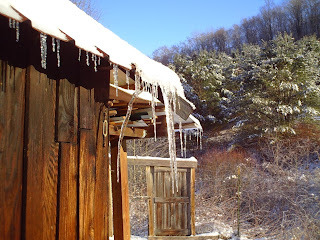 Snow fell with the temperatures overnight and I awoke to 11 degrees outside and 52 degrees inside. Thanks to Lee starting the wood this morning it was into the 60's inside before I bundled up to eat breakfast. The high winds continued most of the day making it hard to play catch up with the cold. This was the kind of day you stayed close to the fire and were thankful for all the wood stacked under the porch close to the house. When you have central heat and a thermostat it is easy to forget what it is like to try and keep a house warm with a wood burner alone. A slight drop in temperature and your furnace responds by kicking up a flame and blowing heat around the house. In our house going to bed means letting the temperature drop as the wood in the fireplace burns slowly out and awaking to a very chilly home. Lee seems to thrive in the cold weather, but I have to admit that the temperatures much below 60 in the house don't thrill me and I do everything possible to avoid being the first one up. The high today struggled to get into the 20's outside with about the same amount of wind speed. Speck and I stayed as close to the fire as possible completing a project for decorating a Christmas tree around the court house in Coudersport. Coudersport does this Holiday tree event every year and a family or organization can pay $18 to decorate a tree around the courthouse area. They are judged in catagories and a $20 prize is awarded to the tree in each catagory deemed the best. Obviously, winning isn't about the huge monetary prize. It is a wonderful way for the chamber to raise money and make the downtown area a little brighter for the holidays. I have to admit I was glad to have something to do inside and be next to the comfort of the fire. However, now that the decorations are made I will have to put them on the tree outside next week. The good news is the temperatures are not supposed to be as cold as today. They will be in the thirties next week making the decorating a bit easier. The winds will slow down a bit as well. The bear hunters were out in full force Saturday at least until the temperatures started dropping. I saw a few cars today but not quite as many as Saturday. The snow on the ground this morning and the cold temperatures remind us we are just starting the cold winter months and have a long way to go until the ground once again warms up and the trees start to bud. I think the bears have it right by hibernating through the worst of winter. As I snuggle up in a blanket in front of the fire with a warm cup a tea, hibernation sounds so good. Mountain girl, Paula, logging out. I have finally finished splitting and stacking firewood. The wood that we will use this winter is under the porches and the wood stacked outside is for next winter. Now I just have to clean up the bark mess and winterize the tractor. What a relief to have that done before we get snow that piles up. Speck got 5 teeth pulled on Monday but he is doing great and seems to be recovered. We will be keeping him on a soft food diet for a few days and giving him anti-biotics for 7 days. He doesn't seem to mind at this point. Actually he prefers a soft diet. Today there were 7 robins in our front yard. It made me think it's going to be Spring instead of Winter. I know you snow mobilers are anxious for good snow but I would be happy for it to hold off for a little while. My sister Diane requested that I post when Paula is busy working so I will give it a try when I can think of something to write. This is Lee signing off until next time. It was a nice day Friday and I was home early so the dogs and I decided to take a walk. They were usual excited bouncing around, Speck let out one loud uncontrolable bark announcing his joy and we started up the road. I try to keep the dogs pretty close to me when I walk in case cars or other animals show up and they are usually pretty good about keeping within fifty or less feet. I decided it would be nice to cut through the pine forest and up a trail I use often that comes out at the top of my property. I love looking over the top of the mountains and the last part of the walk is all down hill to home. So Leo, Speck and I cut in and started climbing up the trail. Leo was in the lead and Speck was about twenty feet in front of me. I noticed Speck was sniffing the ground then suddenly, he is screaming, twisting, turning and snaping at a trap now attached to him. I quickly raced to him and to see Speck violently thrashing, while I am try to see what damage has been inflicted on my dog and how to get this thing off of him. I reached in and immediately got my hand chewed up while attempting to grab the trap. Poor Speck didn't have a clue what was happening to him and bite at anything to get it to stop. Now Leo arrived to investigate the screaming and I had to push him out of the way as well. I worried the longer Speck thrashed the more damage would be done to his small leg stuck in a trap made for a lot larger animal. Blood from my bite and Speck's mouth started to cover him, I finally got the trap in a position I could step on the spring lock and open it while he pulled his leg out. Speck stood a few steps away dangling his back leg and I feared the worst, a broken leg. I picked him up and carried him back home. I cleaned him up and didn't notice any obvious broken leg. The trap had hit him in the hock just below the joint. He still would not put weight on it, but it seemed more from straining his knee joint during his twisting than the actual injured area. I noticed he was licking his lips funny and looked in his mouth to see two of his front upper teeth now hanging at an unnatural angle. In his attempts to free himself from the trap he had broken at least a couple teeth. Amazingly enough in a couple hours he was walking on his back leg and will only have to go to the Vet monday to have his teeth pulled the rest of the way out. As you can see by the size of the trap compared to him, he was very lucky. It could have been so much worse. This is the biggest reason I am not a fan of trapping. 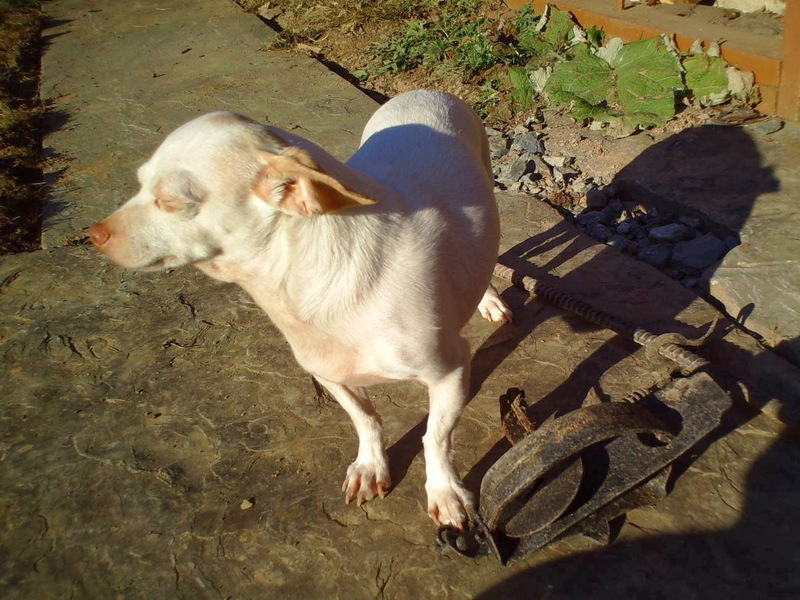 I have seen so many dogs loose feet or legs to trapping. After talking to the game commission, I found out there is nothing I can do since it wasn't on my property. So I guess it is walker beware out there. However I would like to make this plea. If you are a trapper, PLEASE don't trap near roads and pathways unless you mark the trap visably so someone walking themselves or their animals can see it. If my dog hadn't tripped this trap I might have just as easily stepped in it on a path I regularly walk. It is nice when everyone can enjoy the woods without feeling like they have to stay in during trapping and hunting season, which is half the year here. Mountain girl, Paula, logging off. 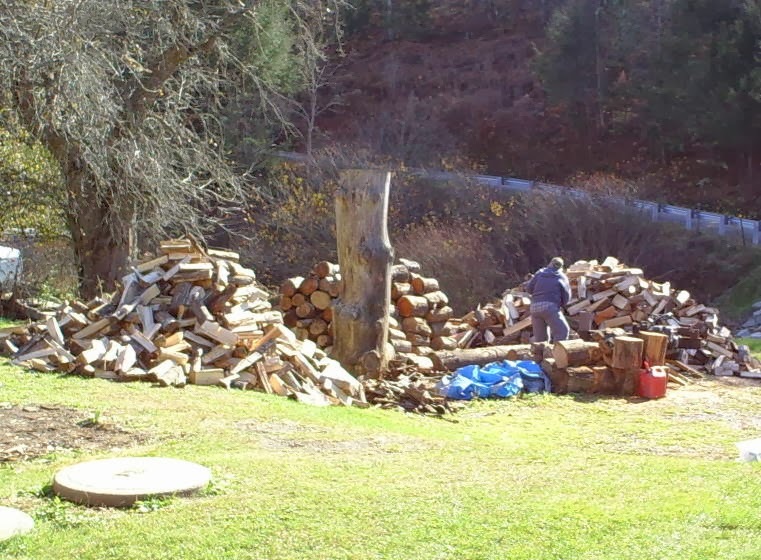 One of the biggest tasks of Fall is getting all the firewood split and stacked. We get a Tri-axle load of wood every other year so it can start drying out for the following year's wood burn. It will be stacked in the sun and dried for up to 2 years before it is burnt. This allows us to get green timber. We add anything we "find" usually in the middle of the road to help complete the two year time span. 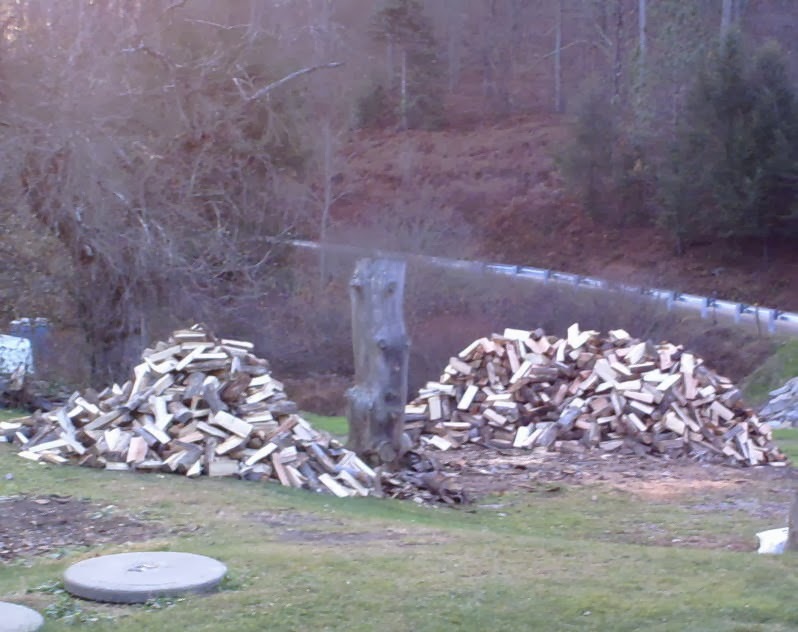 We move the wood we are burning for the winter under our two porches, which is just enough to last the winter. When burning season is over it is gone, this keeps the bugs away from the house since in the winter they are not active in the firewood. 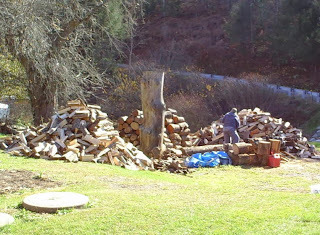 Lee got stuck with doing the firewood this year as I have been working away from the house during the daylight hours. Now that it is all spilt she will stack it in the sun on skids a distance from the house. 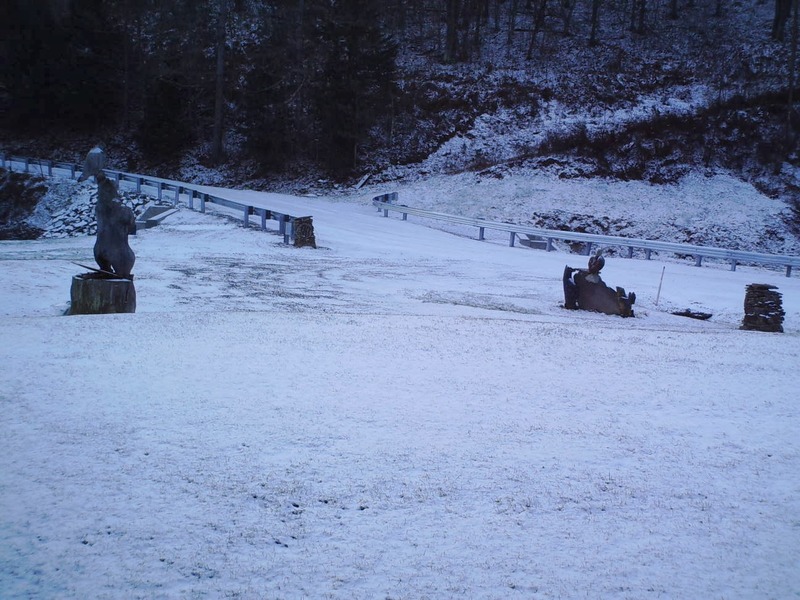 Seems like quite a few hunters have been up for archery season. The bucks are definately running the doe as I have seen quite a few in the evening coming home. Last night I saw a bear getting ready to cross 144 just before Button Hollow road and a porcupine at the top of Cedar Mt. The leaves are mostly off the trees preparing them for the snow that is sure to come. It has been cold enough to remind us that winter is shortly around the corner. 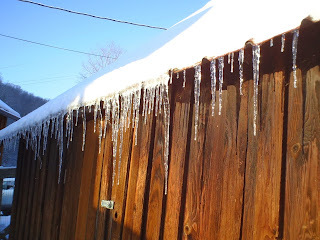 It is too bad we can't schedule snow for when and how much we want and leave out all ice. 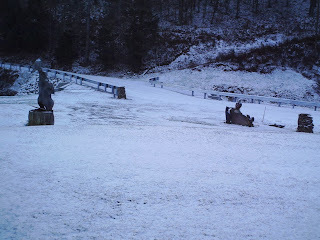 There is nothing prettier than a fresh snow in the mountains and nothing scarier than freezing rain or ice on the roads. Phil has just about finished salvaging out the trailer and is down to the final floor. It will be nice when it is all cleaned up and done. Mountain girl, Paula, logging out and heading up the mountain.